In 1698, in a small, primitive village in the Ukraine, a boy was born. His parents named their son, the only child they had, Yisrael (Israel). This boy, over the course of his 62 years, would completely revolutionize Jewish life, particularly in the Russian Empire where the majority of Jews in the world resided, and eventually the world over. Young Yisrael lost both of his parents by the time he was five. His father's final words to him had been that he should fear nothing but G‑d, and he should feel nothing but love towards his fellow Jews. At a young age, he joined a group of Jews who had taken upon themselves to bring back some life, positivity and optimism back to the Jewish communities which had been decimated by the bloody pogroms of the mid 17th century. The group had been founded over one hundred years earlier by the son of a Jewish refugee who had been expelled from Spain by Ferdinand and Isabella in 1492. This group would later be known as the 'Chassidim', or the Chassidic movement. Yisrael himself would become known as the 'Baal Shem Tov', or 'Master of the Good Name', due to his proficiency in the works of Kabbalah which speak at length about the many names of G‑d. 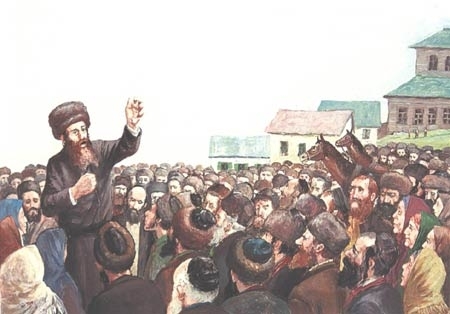 The Baal Shem Tov's revolution, which he launched at age 36, was simple, straightforward, and caused a veritable earthquake in the Jewish world. He taught that the entirety of Jewish study, Mitzvot, customs and rituals all served one purpose: to fulfill G‑d's craving to connect with each and every individual Jew, regardless of background. What is revolutionary about that? Many Jews had hitherto understood that the very validity, value and status of an individual was entirely dependent on how much they studied, or how many Mitzvot they performed. Simply said, it was the scholarship that gave value to the individual. An individual who had studied much Torah was held in high esteem, while one who didn't was worth little. The Baal Shem Tov reversed that. While upholding the immeasurable importance of Torah study and scholarship, his philosophy preached that it was the individual that was held in the highest regard by G‑d - just for being a member of the Jewish people. The reason why G‑d gave the Jewish people the Torah and its commandments, was simply a means through which G‑d could connect to the people he loved so dearly. Eventually, millions of Jews, from world renowned scholars to farmers and water carriers, would join the Baal Shem Tov's new movement, and many sub-groups were born out of it (Chabad being one of them). Nearly three centuries later, the Baal Shem Tov's timeless teachings of the importance of each and every individual, and of his or her irreplaceable value, are more important than ever. His simple message of 'you really matter' touched the lives of millions, and continues to do so today.